This 6.5 acre piece of land in Salmesbury was purchased by a returning SDA client. The site itself is a large area of meadowland set within Green Belt so our expertise in planning laws was a key component for the success of the project, as was creating a sustainable and exceptional design. SDA Architecture are very honoured to be one of only a very small number of architectural practice that have gained approved under Paragraph 55 of the National Planning Policy Framework. The paragraph 55 is a special clause in planing policy that allows homes of exceptional design to be built in the countryside. The clause states planning consent may be granted if the proposals represent ‘exceptional quality and innovative nature of the design’. After preparing a feasibility assessment, concept designs were created. The client provided a brief of room requirements but as with most design led Green Belt developments the client left the style, house type and design to us. Some of the most successful designs are often the most simplistic designs, this one takes its inspiration from a agricultural hay barn. The area of the house visible from the roadside has been designed to imitate a agricultural barn sympathetically sitting within its meadow setting. However, the subterranean sections of the property make it truly unique. The slatted wood is used as a screen for large open expansions of glass which allow views onto the open countryside. 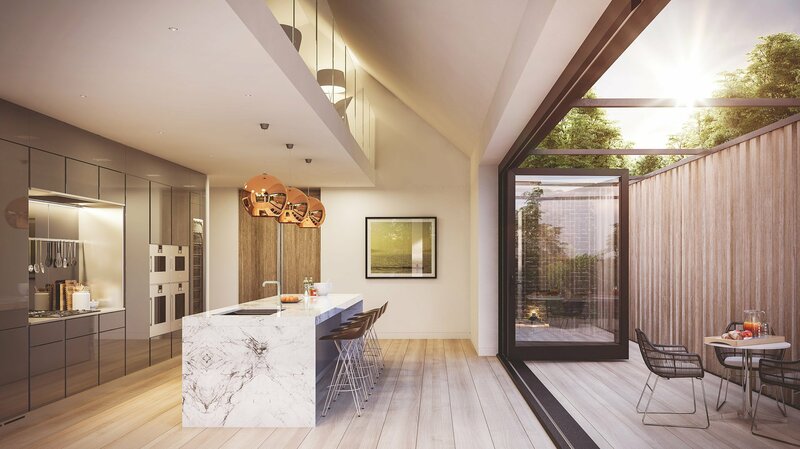 The topography of the land has been integrated seamlessly to the design creating a dual levelled feature spaces for the dining, living and subterranean bedroom areas. A beautiful snug room is created with open wood burner that is nestled gently next to the bank of a stream at the bottom of the meadow, outside living in the true sense of the word. The 5 bedrooms are all suites incorporating ensuites and dressing rooms with the home providing over 6500sqft of bespoke living space. Our client, the local authority, local councillors and residents all commented on how thoughtful and sensitive the design was which gained it the necessary support.